The Braun Series 9 9290cc Men’s Electric Foil Shaver, Wet and Dry with Clean and Renew Charge Station is considered one of the best electric shavers. It has been tested on various lengths of beards and has been proved as one of the most effective in the world when compared to some of its powerful competitors. It has been recognized as the world’s “most efficient shaver”, because of its power-packed performance, sophisticated technology, ease of use and quality of results. This is one of the few shavers in the world that is exceptionally gentle on the male skin. Great things don’t come cheap, do they? Likewise, this powerful shaver comes with a steep price. While its retail price is a whopping £330, Amazon offers a is currently selling it for around £220. Read through our electric shaver review to look at all the features, pros and cons of this shaver to get a deeper understanding of this product. Uniquely designed shaving head with five shaving elements that capture more hair in one stroke. Trimmer comes with titanium coating which is resistant to all kinds of corrosion, durable and stylish as well. Titanium has a similar look to gold but its extreme durability makes it the perfect metal to be used in a top rated electric shaver. Syncro Sonic Technology, which makes the shaver adapt to the length and style of your beard. It has 40000 cross cutting actions per minute and checks the density or your beard which it is cutting 160 times per minute. This allows it to use extra power to remove denser hairs or hairs from difficult areas in the most efficient way possible. 100% waterproof up to 5 meters, which works with it being a wet or dry shaver. Can use foam or gel or neither. Will shave cordlessly for up to 50 minutes when fully charged which takes one hour to charge. Also has a 5-minute quick charge and has automatic voltage adaptation for anywhere in the world with 100-240v. Uses a Li-ion battery. Braun recommends using the razor at a 90-degree angle while you shave, and to shave before you shower while shaving against the direction of your beard growth. 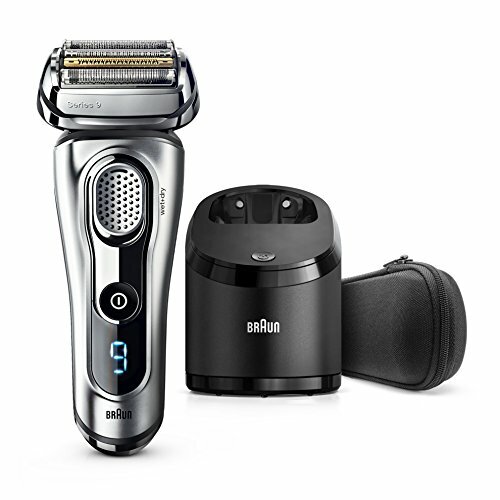 As well, Braun suggests you replace all cutters parts every 18 months on your electric razor for the best performance possible. Though the Braun Series 9 9290cc Men’s Electric Foil Shaver is considered to the world’s best shaver by experts. It is currently rated with 4.4 out of 5 stars and 88 percent of the ratings 4 stars or higher, and less than one percent with one star. 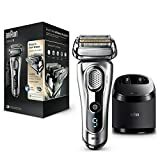 This is one of the best electric shavers out there and we recommend this as a great selection which would last you for many years based on the vast amount of fantastic features it has and the stellar electric shaver reviews. If the price point of the this electric shaver is a lot to fathom, then we recommend you read the review for the Braun Series 7 7898cc Men’s Electric Shaver Review. It offers almost every feature of the Braun Series 9 9290cc, but at a more budget friendly price point, and also has stellar reviews.